Before you place a deposit on a puppy, here is a little bit of information you need to know. By this time, I hope you have read through my website. But let my jot down a few of the important things that you might have overlooked. First off, congratulation on becoming a future puppy owner to a SCGD pup! Be confident and know that we do all the DNA/Disease testing that comes available in the laboratories for the breed of dogs we are breeding. (Goldendoodles and Australian Labradoodles). Even if they come out with new test for diseases, we send in swabs of saliva to the labs from each of our current or future moms/dads. If the labs offer the test for it, we do it! To get on the bulk waiting list, you will need to send in $50. This is the pre-deposit. If there is a current litter, either pregnant or that already has puppies on the ground, the full $500 is due. The $500 is the only amount mandatory before picking up your puppy. That is if you bring the remaining in cash. ($2,500, which bring the total to $3,000). If you decide to pay in checkform, you are welcome to send a few each couple weeks until payment is in full, but it must be done by 6 weeks of age. No checks will be taken after they are 6 weeks old. 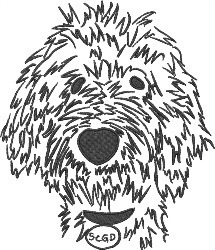 We will start your puppy on the PawTree Dog Food, Chicken and Brown Rice. We will soak the food and make it into a gruel starting at 3.5-4 weeks old, depending on the mother’s milk production +/- the number of puppies in a litter. We will start leaving the food soaked into formed pieces around 4.5-5 weeks old. At 5.5 weeks old, we start adding a handful of hard, non-soaked PawTree Whitefish and Brown Rice (Poultry Free). Between 5.5-6 weeks of age, we will have them transitioned over completely to the Whitefish and Brown Rice flavor. This is the food you will need to have ordered by the timeyour puppy is 6 weeks old. It could take up to 1 week for the delivery to make it to your home. Click Here. Another important note is that the contract you will sign, states you will feed PawTree Dog Food for the first 9 months of your puppy’s life. We have so much confidence in this food, that we make it a must! If you do not keep your puppy on this food, your puppy’s 2-year warranty guarantee will be null. If you do keep them on this food for longer than the 9 months… up to 4 years, you get an extra 2 years added to your warranty guarantee! We have a bulk waiting list that holds a family’s place for future puppies. This allows families to prepare and expect to get a puppy when listed. Some families just want a chance at any available puppy and others that want a certain gender, coat markings or texture. This waiting list is one of the hardest parts of this job because future parents need to pass testing, females need to cycle regularly and get pregnant. There is always a chance a female will not take… or they might have a small litter. We know what is expected in each mating; Coat Colors, Textures and how big the litter number will be. But it is Geneticsand sometimes it has a mind of its own! This might leave us all in a bind, waiting on that perfect puppy to come along. When puppies are born, we will start at the top of our waiting list and give the families the details on the number of puppies, gender, colors, and take-home date. If the details work out for afamily, they will be put on this litters individual waiting list. If a family passes, they will keep their spot on the bulk waiting list (or move higher) for any future litter. If a family decides to back out later than the puppies 4 weeks of age and wants to move to another litter, they are obligated to lose that deposit and send in another $500 to remain in their spot on the waiting list. We want and need families to be prepared for at least 4 weeks before taking a puppy home. That is only fair to the puppy, and the family. We will have the puppies go to the vet for their check up around 6 weeks of age. This allows families to read over the vet exam and start the puppy picking process. We recommend no one feelslike they need to pick which puppy they desire before the vet exam. The final decisions will not be made until after the families read through the exam notes. We encourage families to pick their puppy due to temperament and health; over color, markings or gender. Last but not least, when everyone knows which puppy they are taking home (which should be at 6 weeks age), I will order training leashes that can be used as soon as you leave the premises. It is a slip lead, which is fantastic for training. These leashes will be personalized. So, if you already know the name for your puppy, we will get it put on the leash for you. If you do not know what you want to name your puppy yet, that is completely fine. We can put your last name +/- phone number. Thank you for reading over this, as we want you and your family to be completely prepared before your puppy comes to your home. -When puppies are born, you have until they are 3 days old to decide if you want a chance at that litter or to move to a future litter. -Order the PawTree Whitefish and Brown Rice so it has time to ship and be at your home by the time the puppy arrives. -Send us your puppies name so we have time to personalize and order the leashes. -If paying with anything other than cash, payment must be done in full by the puppies reach 6 weeks old. Please do not show up on pickup date with a check to fill out.